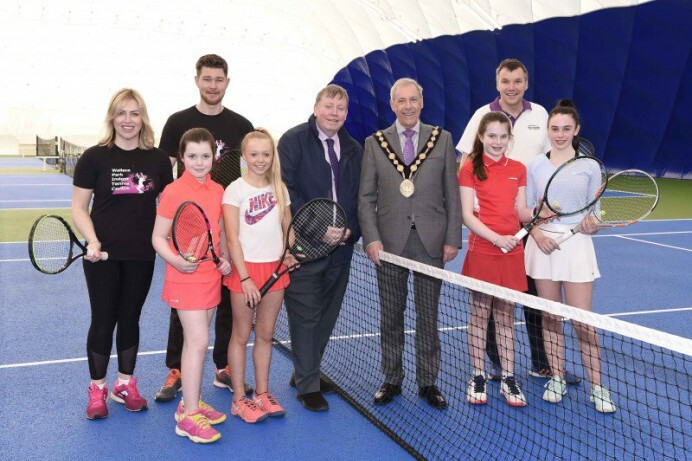 Lisburn & Castlereagh City Council (LCCC) has reinstated its tennis dome facility in Wallace Park. The dome was officially reopened on Saturday 6 April at the Mayor’s Carnival Parade and Family Fun Day and a new programme of events has been put in place to launch the reopening of the three court facility. The Wallace Park Tennis Dome was first introduced in 2012 and was taken down in September 2018, following extensive damage caused by Storm Ali. The facility has attracted elite tennis players, with the Ulster Tennis Squad having used it as their training courts in the past. But perhaps the greatest success of the tennis dome has been its ability to attract a wide variety of players including competitive, social and elite across a range of ages. Alderman Paul Porter, Chairman of the council’s Leisure & Community Development Committee, said: “We’re delighted to be reinstating the Wallace Park Tennis Dome, which has proven extremely popular with residents and visitors. There has always been a huge interest in tennis in Lisburn and this centrally located facility, with its three self-contained courts, will complement the wide range of sporting options already available in the city. Wallace Park Tennis Dome is now open Monday to Thursday from 10am to 10pm, Friday and Saturday from 10am to 5pm and Sunday from 2pm to 5pm. The dome is located behind Lisburn Cricket Club and can be used for general tennis bookings as well as tennis coaching, which will be available for all ages and abilities. For bookings or to find out more, call 028 9266 0653 or go to www.tennisfundamentals.com. Players also can book courts and see what’s on for their level and age group by downloading the free Play More Tennis app or following www.Facebook.com/WPTennis.